Dr Gail Kenning is and artist, researcher and educator. She is Research Associate at University of Technology Sydney in the Faculty of Arts and Social Sciences, Faculty of Engineering and IT and Faculty of Design Architecture adn building, and Co Investigator International on a UK AHRC funded research project—LAUGH: Ludic Artefacts Using gesture and Haptics— making objects and activities for people with late stage dementia. Her research is concerned with art and creativity in relation to digital media, craft, expanded textiles, health, wellbeing, ageing and dementia. Gail is the recipient of funding for work related to craft and wellbeing; for the evaluation of arts programs for people with dementia; and projects exploring participatory design approaches working with and for people with dementia. She is a member of international collaborative research projects including Materialising Memories Research Program (UTS and University of Technology Eindhoven) and HANDS: Helping Assist With New Devices for Seniors, in Collaboration with Dr Cathy Treadaway, Cardiff Metropolitan University, Wales. Gail is a Design Unnited Research Fellow at University of Technology, Eindhoven, Netherlands where she researches in relation to implicit memory, ageing and dementia. Gail works at the intersection of art, craft, design and technology. Her artistic practice spans sculptural installation, photography and video, programmed animations and data visualization. She has exhibited and screened works internationally and nationally at public galleries, private galleries and artist run initiatives. Gail was awarded a PhD Art theory from University of New South Wales (UNSW 2009) for her work exploring evolutionary patterns and code in relation to craft-based textile forms. She is published in journals such as Media International Australia and Leonardo, has presented at conferences nationally and internationally including the International Symposium of Electronic Arts (ISEA) in 2009, 2011, 2013 and 2015 is an invited speaker, including at Hangzhou, Academy of Arts, China. Alongside her art practice has worked in research and data visualization in industry for over ten years, and was director of a computer aided research and media analysis company developing acclaimed commercially available software products. She consults to companies on the development of systems to enable effective data visualization. Gail’s research in relation to digital and social media includes E-electioneering, 2007, 2010 and 2013 exploring the use of social media in Australian elections. 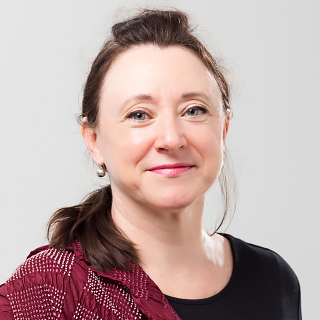 Gail's research interest include art, design and craft in relation to digital media, health and wellbeing, dexterity, ageing and dementia and data and information. Treadaway, C & Kenning, G 2016, 'Sensor e-Textiles: person centered co-design for people with late stage dementia', Working with Older People. Craft-based textile activities such as knitting, crochet, tatting and lace making have provided challenges, physical and mental stimulation, creative outlets, and social interaction for generations. The role of craft and the relationship between craft and maker vary across cultures, geographic groups and gender. However, a common thread is that craft practitioners are often emotionally invested in these activities and many continue to make through all stages of life and into old age. Given the global ageing of the population, activities that can be carried out by people with reduced mobility and increasing physical or mental limitations as a result of ageing, and which can promote healthy ageing and positive well-being are now becoming increasingly important. Existing research has established a link between creativity and health and well-being. But, it is only recently that multidisciplinary research involving arts and crafts, social science, and medical and health scholars and practitioners, has begun to show the importance of activities, such as craft-textiles, for positive well-being. The relationship between craft activities, creative engagement, mental and physical stimulation, social interaction, self-esteem, and therefore, positive well-being has been insufficiently explored. This article reports findings of a study of lace makers at the Lace Study Centre at the Powerhouse Museum, Sydney, Australia that examined how craft activities contribute to well-being in a variety of ways. This research, which focused on female practitioners, found that craft-based textile activities and associated social practices provide insights into the individual and societal importance of 'everyday creativity' for promoting positive well-being and general good health. Kenning, G 2015, 'Fellowships, Residencies and Resonances: A Self-Interview', Media-N: Journal of the New Media Caucus, vol. 11, pp. 1-6. My name is Gail Kenning. I am an artist, researcher, educator, and writer. The following article is an interview with myself. I am currently Design United Visiting Research Fellow at Eindhoven University of Technology (TU/e), Netherlands. I will be returning home to Sydney, Australia, where I am Researcher at University of Technology Sydney (UTS), Australia. I wanted to take time to reflect on this particular experience and also to think about what residencies and fellowships means for those in the new media field. The self-interview format allows me to briefly address some of the questions that come to mind when completing a fellowship or residency. Domestic craft-based textile activities, such as knitting, crochet, hand weaving and lace making, are often viewed as being of limited creative potential. The perceived lack of creativity arises, in part, out of the extent to which these activities copy, reproduce and re-create existing pattern forms and use preexisting templates. This paper reports on the findings of an experimental research project that explored the creative potential of crochet lace making using digital media, technologies and practices. It provides critical analysis of how new technologies, practices and theoretical frameworks have implications for ongoing domestic craft-based textile activities. A quantitative and qualitative analysis of the use of social media by politicians and the two major political parties, in the 2013 Australian federal election, compared with social media use in the 2007 and 2010 Australian national election campaigns, with particular focus on one-way transmission and broadcasting of information versus interactive engagement. In the wake of the 'turning point' 2004 US presidential election, the Obama campaign of 2008, the 2010 UK election and e-democracy movements globally, Australians went to the polls in 2010 in a media-hyped flurry of tweeting, YouTube videos, Facebook befriending and 'liking', blogging and other social media activities. Following a study showing that the 2007 Australian election was not a 'YouTube election', as claimed by many media and commentators, and that social media use in the campaign was mostly non-interactive promotional messaging, a study was undertaken during the 2010 federal election campaign to gain comparative data and updated insights. This article reports quantitative and qualitative content analysis of social media use by 206 federal political candidates and the two major political parties during the 2010 Australian election to identify trends in the volume of e-electioneering content and activity, as well as the main ways in which social media are being used in political communication. Kenning, G 2008, 'EM Files: Adam Laerkesen', Art Monthly, vol. 0, no. 212, pp. 47-47. Kenning, G 2018, 'Visual stimulation and visual analysis in design: Participatory and co-design approaches for people living with dementia'. In November 2015 the New South Wales (NSW) Department of Premier and Cabinet launched a digital campaign using social media, websites, and paid online search to reduce the incidence of recreational use of Cannabis among 14–18 year olds – the age range identified as the period in which people are most likely to first try recreational drugs. Media metrics and social media tracking of the campaign found that it was perceived to be 'fun' but 'credible' and was widely shared within the target audience in its first month when messages were highly targeted through special youth sites and paid search. But in mid-December when the videos and GIFs featured in the campaign went 'viral' attracting more than 3.5 million views in a few weeks, the campaign received widespread criticism in traditional media and more than 30,000 comments on social media, most of them negative. It was labelled 'one of the worst campaigns of 2015' in newspaper headlines and the government terminated the campaign in mid-January 2016 and ordered a detailed independent evaluation . Subsequent in-depth quantitative and qualitative evaluation showed that the 'edgy' youth campaign did in fact achieve many of its objectives among 14–18 year olds, causing them to 'think twice' about using Cannabis and reducing perceptions that using the drug was 'cool'. However, the campaign raised major questions about the common view that 'going viral' is positive (Godin, 2001; ImagePro, 2016) and provides lessons for planning digital campaigns. Kenning, G & Law, J 2016, 'The Phenomena of Knitting and Crochet: Craft-based textiles and Computational Media' in Luckman, S (ed), The Craft Economy: Making, Materiality and Meaning, Bloomsbury (UK). Kenning, G, Treadaway, C, Fennell, J & Prytherch, D 2018, 'Evaluation or 'anecdote'? Understanding the impact of design', Proceedings of the 5th European International Conference on Design4Health, Sheffield, UK, 4th – 6th September 2018. Sheffield: Sheffield Hallam University., 5th International Conference on Design 4 Health, Sheffield Hallam University, Sheffield, England. Designers are increasingly engaging in participatory co-design approaches to understand the needs and wants of the people who will engage with the artefacts produced. These approaches are particularly relevant for design that focuses on social change, work undertaken with vulnerable groups who may not be articulate, and for designers working across disciplines, engaging with, for example, health related issues. While these projects may have clear goals in terms of outputs, often outcomes are not as clearly defined. So, how do we measure, evaluate and understand what has taken place, and reflect and report the findings? This paper reports on a UK-funded research project designing for people living with advanced dementia using mixed methodology research and evaluation. It explores issues around how designers self-evaluate and report on outputs and outcomes, and how robust evaluation can be undertaken throughout projects that use design research and thinking, or action research approaches. While, informal feedback in design projects can sometimes be dismissed as 'anecdotal', it suggests that unsolicited responses provide rich and valuable data to inform the overall evaluation and findings of a project. While designers may resist evaluation, feel that evaluation is imposed on them, or are not sure how to evaluate their projects, this paper suggests that by evaluating appropriately they can produce evidence to show the value and importance of their work. Lazar, A, Toombs, AL, Morrissey, K, Kenning, G, Boger, J & Brankaert, R 2018, 'CHI 2018 Engage with CHI', CHI 2018 Engage with CHI, Montreal, Canada. © 2018 Copyright is held by the owner/author(s). Increasingly, HCI researchers are recognizing the challenges and opportunities of designing with and for people living with dementia. Recent critiques have highlighted the limited ways people with dementia are engaged in the research and design process. The second CHI HCIxDementia workshop will focus on engagement with and by people living with dementia. Through interactions with local community organizations and people living with dementia, workshop attendees will explore design possibilities. Building on open questions from the CHI 2017 workshop, this workshop will address how HCI researchers can support people living with dementia in engaging as leaders and with research, industry, and the community. Kenning, G 2017, 'Evaluating Art and Design projects for Dementia'. Kenning, G & Treadaway, C 2015, 'Art and Design Research for in the Moment Fun and Pleasure', Art of Good Health and Wellbeing, Arts and Health Australia, Sydney. This paper describes research investigating the design and development of new kinds of sensory textiles to be used to support the subjective wellbeing (SWB) of persons with dementia (PwD). An international collaborative research project is presented in which participatory and inclusive design methods have been used, informed by the expertise and experience of a variety of stakeholders including carers, occupational therapists, PwD and their families. As the median age of the global population increases a larger proportion of the population will be what is considered old. The aging process causes physical, cognitive and emotional changes and shifts the individual's perception of their world. Artists and designers are increasingly working with practices that intervene, interact and bring about transformation. They engage with publics that operate as participants and co-creators and as such are increasingly likely to engage with older people. Western culture has increasingly pathologized aging with a focus on countering its impact and delaying the inevitable end. The individual is addressed as a less able version of him or herself and assessed in terms of deficit, lack and loss. Art and design projects with older people often get caught up in the pathologizing of aging. They are viewed and assessed in terms of art therapies or positioned as assistive technologies within medical, scientific and technological discourses. This critical analysis explores how aging can be addressed in terms of the capacity and potentiality of older people. It investigates how, by employing ethnographic, person-centered approaches focusing on personhood and affect, artists and designers can challenge and transform accepted views of aging. Treadaway, C, Kenning, G & Coleman, S 2015, 'Sensor e-Textiles: Designing for persons with late stage dementia', Proceedings of the 3rd European Conference of Design4Health, Design4Health 2015 European Conference, Sheffield Hallam University, Sheffield UK. Kenning, G 2008, 'Crochet Lace as Expression of Digital Culture', http://digitalcommons.unl.edu/cgi/viewcontent.cgi?article=1108&context=…, Textile Society of America: Textiles as cultural expressions, Textile Society of America, Honolulu. Kenning, G 2008, 'Exploring evolutionary possibiltiesfor digital doilies', Generative Art 2008, Domus Argenia, Milan. Kenning, G 2015, 'Arachne's Muse', Archipelago Press, Sydney. Kenning, G 2015, 'Penelope's Muse', Archipelago Press, Sydney. Kenning, G, 'Evolutionary lace', Powerhouse Museum Sydney, Powerhouse Museum Sydney. Kenning, G University of Technology Sydney 2017, Making It Together: Reciprocal Design to promote positive wellbeing for people living with dementia, Sydney. Kenning, G Art Gallery New South Wales 2016, Art engagement for people with dementia: Independent evaluation of the Art Access Program Art Gallery of New South Wales, Sydney.